With Five New Judges, Is SC’s Profile Set To Change? The five new Judges to the Supreme Court, appointed recently, will take oath in the Chief Justice’s Court at 10.30 tomorrow, and sit in the first five courts, in order of their seniority in the Court. Thus, Justice Sanjay Kishan Kaul will sit in the Chief Justice’s Court, (along with justices N.V.Ramana and D.Y.Chandrachud); Justice Mohan M Shantanagouder will sit in Court No.2, along with justices Dipak Misra and R. Banumathi; Justice Abdul Nazeer will sit in Court No.3 along with Justices J.Chelameswar and Abhay Manohar Sapre. ; Justice Navin Sinha will sit in Court No.4 along with Justices Ranjan Gogoi and Ashok Bhushan; and Justice Deepak Gupta will sit in Court No.5 along with Justices Madan B.Lokur and Prafulla C.Pant. The seniority of the Judges in the Supreme Court is determined according to the date of their initial appointments as the Judges in the High Courts: the earlier appointee is considered as the senior-most. Although the date of initial appointment as the High Court Judge is the same for both Justices Mohan Shantanagoudar and Abdul Nazeer, that is, May 12, 2003, it appears that as Justice Nazeer was initially appointed as the Additional Judge, and later made a permanent Judge on September 24, 2004, Justice Nazeer’s seniority is placed next to that of Justice Mohan Shantanagoudar. Or it may be that Justice Mohan Shantanagoudar’s enrolment as an advocate is prior to that of Justice Nazeer. Interestingly, none of the five new Judges will get an opportunity to serve as the Chief Justice of India, before their retirement, as all of them would retire, before Justice D.Y.Chandrachud, retires on November 10, 2024. Justice Chandrachud will take over as the CJI after Justice Uday Umesh Lalit completes his two-month term on November 8, 2022, and have the longest tenure of two years in recent years. 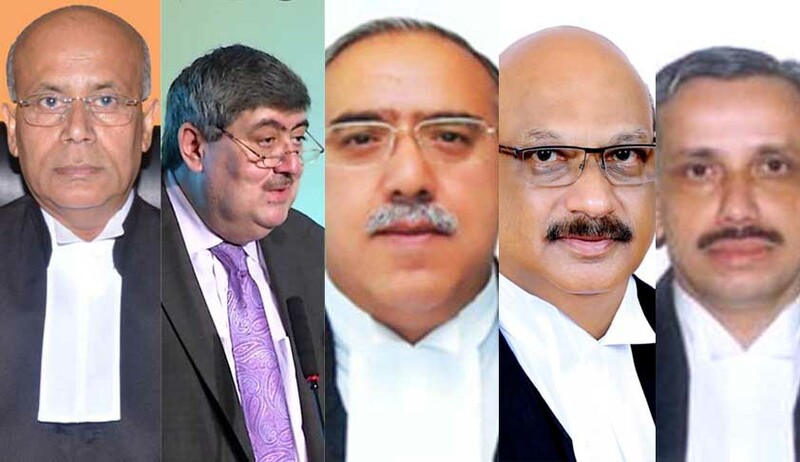 With Justice Kaul, the number of SC Judges from Delhi has risen to five (Justices Madan B.Lokur, A.K.Sikri, Rohinton Fali Nariman and Uday Umesh Lalit are the existing four, although the last two are from the SC bar directly). The remaining four new Judges represent States which are not currently represented in the court. Thus Justice Deepak Gupta is from Himachal Pradesh; Justice Navin Sinha is from Bihar, and both Justices Mohan Shantanagoudar and Nazeer are from Karnataka. With three more vacancies in the Supreme Court remaining to be filled, speculation is rife on which states they may represent. Delhi (5), Andhra Pradesh (3), Maharashtra(3), West Bengal (2), Uttar Pradesh (2), Madhya Pradesh (2), probably would not get one more representation. There is certainly room for appointing Judges from Punjab (with the current CJI retiring in August), North-eastern States, Jharkhand, Chattisgarh, Jammu and Kashmir, and Gujarat, which have no representation at present. Besides regional representation, the composition of the Supreme Court also requires diversity in terms of religion, caste, class and gender. Observers hope that the remaining vacancies will be filled by the Collegium, keeping these factors in mind.